Just looked at my Past Top 10s, and I can’t imagine why this film isn’t in the Top 10 for 1956 (nor can I quickly find my earlier grade … this was a total impulse watch in “morning hotel room” mode). After all, it’s not as though I’m exactly shy about loving certain films more than I “should,” or about the fact I’m a huge real-boxing fan and will watch boxing films even when they’re not good. But this film actually is very good, practically the Platonic form Boxing Biopic. I know when I saw this movie the first time (this is about my 4th viewing), I was resistant to Paul Newman’s performance, thinking of it as a mannered caricature of a lower-class “guido” from someone who I knew from his life and later icongraphy was the very opposite and also didn’t look terribly like Graziano. 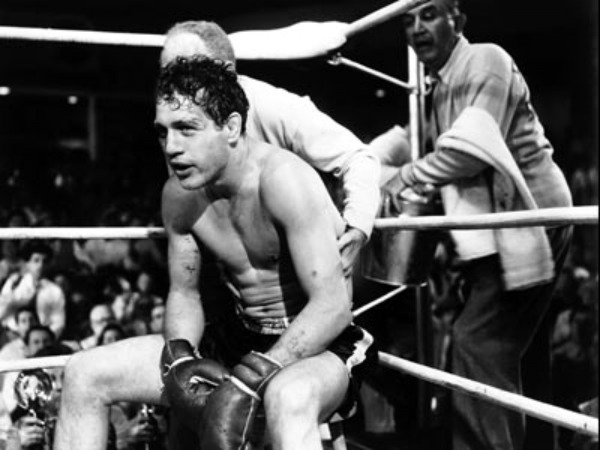 Over the years, I have softened my opinion about Newman’s performance and now pretty much treasure it — from seeing other boxing movies, from seeing other celebrity biopics, and from seeing the real-life Rocky Graziano in the ring and out of it. It’s more complicated than “but Graziano was a ‘guido’,” because Newman does not and does not try to look like him. It’s that I’ve now seen enough mimicry masquerading as acting to respect Newman’s efforts to act like a working-class Italian tough guy without specifically aping a particular one. 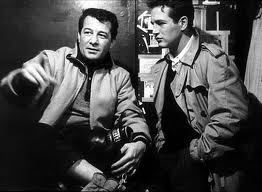 And having a genuinely great actor like Newman, in his youth no less, helps greatly in the nonfight scenes. For example, in the proposal scene outside the courthouse with Pier Angeli, Newman’s body language and Method-inspired mumbling speech (it does SOMETIMES work) creates Rocky as a guy too shy to admit he’s in love, and who has to come with some excuse, ANY excuse, no matter how lame (“I don’t like courthouses”). Seeing the real-life Graziano’s fights also gave me a greater appreciation of how Newman was actually able to fight like Graziano fought (a tougher achievement than it looks), though I acknowledge it helps that Graziano wasn’t a “cutie” or a counterpuncher — he fought swinging for the fences. It also helps that the Zale trilogy is not merely the greatest of its kind in boxing history but was tailor-made for the movies. All three fights were short, ultra-violent and back-and-forth, as Hollywood likes them but as very few real-life fights are. SOMEBODY only *shows* the second Zale fight, the one Rocky won — the women at the home front listen to the radio broadcast of Rocky getting KO’d in first fight; and the movie ends before Zale wins the rubber match. But that scene is one of the great achievements in sports-movie history, both convincingly choreographed and “you’re in the middle of the ring”-intense — two virtues often in competition. I also appreciated a lot this time the way Wise inverts the convention of the “rise-to-the-top montage” from a million fight films. He does some of that with early fights, but when Graziano is making his way through the top contenders (i.e., the fighters good enough that you have to take a beating yourself to win), we see a montage of Rocky’s first-born growing up and reacting badly to seeing Daddy come home with a varyingly mangled face. And it’s got a good … ahem … punch line. SOMEBODY also avoids the shapelessness that often haunts the biopic. The film is based on Rocky’s autobiography and while we all tend to narrativize or teleologize our lives, Graziano’s life was like a three-act drama (or close enough to provide a clear dramatic throughline with no liberties). He’s a tough thug who could do nothing but wrong in a bad environment (Graziano apparently knew in real-life boys who grew up to be men who sat in the electric chair) but who found redemption in the ring and with a woman. And his past sins (desertion, blackmail and fight-fix threats) play a role later on, in his boxing career, meaning there’s actually a dramatic “payoff” reason for all the events early on. But redemption doesn’t happen in a pat and easy way. A hack 50s screenwriter, for example, would have had the Army stint force Rocky to learn discipline. In SOMEBODY, it doesn’t of course, in large part because it didn’t in real life. But happily what really did happen is dramatically more interesting.